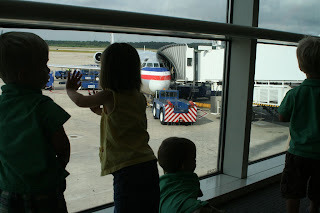 It's that time - our annual dose of complete insanity as Chris and I attempted to maneuver the Houston Bush Intercontinental Airport for a long visit with our family in the Heartland. This flying business is quite the challenge with four very energetic toddlers who still don't speak the same language as we do. Try explaining to a 21-month-old strong willed little one that their shoes, blankets and wagons need to go through the security x-ray machine and we'll pick them up on the other side. I was dragging a screaming crying bunch through the metal detector as fast as I could to try to show them that we were in fact getting their precious belongings back. I must've been as red as their wagons while trying to nod a little thanks for understanding and yes, we hope we're not on your plane either to the passersby who were all giving me long looks of pure pity. We made it through and managed to get everyones clothes back on and head to go get breakfast. Again we had a communication error where Cohen assumed Daddy had left us for bad behavior at the security gate and we were never going to eat again. And again I turned a few shades of red as I tried to calm Cohen down while praying the half dozen customers in front of Chris were just ordering a cup of water. It was 3 minutes that felt like an hour but we got our breakfast and everyone was happy and ready to explore our terminal. 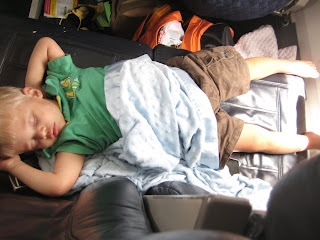 We let the kids run around a bit before boarding the plane in hopes they'd be tuckered out and ready to sit still. The games didn't quite prepare the whole bunch to sit still. A few screams of protest that echoed throughout the plane were quickly translated as my little travel companions way of asking me to sit with Daddy instead. So once we had those seating assignments rearranged were on our way and had quite a pleasant ride. The layover was short but long enough for diaper changes and some lunch. By lunch I mean running around the terminal to finger paint a few chairs with the pizza we were trying to stuff in them before the next leg of the trip. 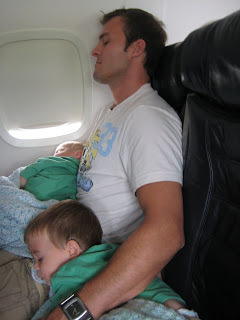 Once we were in the air we had a nice gift of four little nappers on that next two hour plane ride! (Shout Out to Moni - Thank You!) 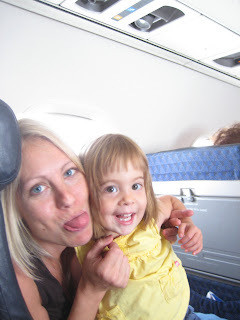 We have never had so many compliments on how sweet and good our kids are as we did on that flight! Thank goodness they didn't see them in Houston! Glad to hear you made it to the Heartland safely, intact and only slightly worse for the wear!!! Hope my little "contribution" spared you a few glares from other passengers. Lord knows you helped get me through our first flight with quads back in November when we flew to LA for America's Funniest Home Videos. Saying there was mass chaos, confusion and insanity would be an UNDERSTATEMENT! Have fun visiting with the fam...can't wait to see how much things have changed from last year! You made it! Having gone on field trips with two's, I admire you and Chris for keeping everyone together, relatively happy, and safe (and those naps certainly help). God's richest joy and blessings during your time with your family. Much love. They look so sweet sleeping on the plane! Hope you have a great trip!! I am so impressed! I can't imagine flying with my crew! Woohoo! And thru IAH...impressive! I am so glad you got there safely. I know you must've been exhausted. You guys amaze me. No joke! Great post Mar.. makes me miss you so much it hurts. Have fun.. and Chris, don't get into too much trouble all by your lonesome! ps: kiss those toddlers for me and play a little game of peek a boo with Sophia too! Just wondering, do you have to purchase a seat for each child on the flight? 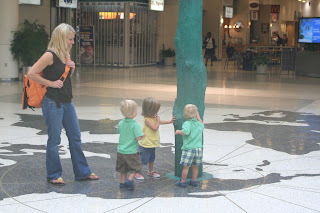 Also, please share Moni's contribution if it will at all help with our upcoming first air travel with triplets plus 1! Man...you guys are SUPER parents flying with your four! So cute!